It's time for Santa Paws! Leslieville is not only a wonderful place to visit, eat and shop, the neighbourhood is friendly and the folks are kind and generous. Last year we started Santa Paws- a $2 donation drive to a much need cause. With the help of the lovely people of Leslieville we donated over $500 and collected much need supplies for The Ugly Mutts Rescue. This year we've teamed up with Moosonee Puppy Rescue. All of the proceeds from our Santa Paws will be donated to this wonderful rescue and we are collecting gently used collars, beds, leashes, bowls, blankets and toys. We are also very excited to announce we will host another adopt-a-thon in early January, more details to follow. Check out our Facebook page each week as we introduce the six puppies that will be up for adoption! Dogs in Northern communities have it pretty rough. Since there are no veterinarian services, one method of population control is to shoot them. The dogs that survive face neglect, abandonment, abuse, starvation and are vulnerable to the elements. One female and her offspring can produce 67,000 puppies in six years! Nurses and teachers on the reserves often rescue as many puppies as they can take into their own homes but there are just so many. Puppies are often found injured, sick or frozen in snow banks. Very few females over the age of 5 are rescued as they are usually shot after delivering a litter. The situation is appalling. Sharron, Paul and their team from Moosonee Puppy Rescue save thousands of lives each year. The cost of the rescue and rehabilitation is all out of their pockets. Currently there are 40 puppies in need, if ever there was an organization worthy of your hard earned dollars this is it! Please purchase your $2 Santa Paw and help save lives this holiday season. 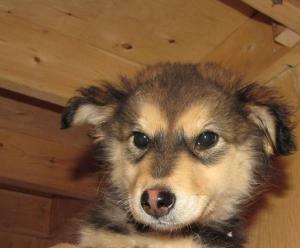 All photos courtesy of Moosonee Puppy Rescue. Project Rescue: Mike has a home! Wonderful blog followers, we have a (semi)final update on our mission to find Mike a home. After a few long days of travel, Mike and the other 3 pups finally made it to Canada in the early hours of October 28th. Two pups, Missy and Kim went to the St.Catherines Humane Society, both very adoptable girls. Zola went to a foster home here in Toronto, which may just turn into her forever home. Best of luck Ian and Zola! Mike of course came to us. He was exhausted, hungry and a little confused but with his physical scars healing and his emotional scars behind him he was ready to embark on his new adventure with a wagging tail and smiling eyes. The very next morning Chris and Danielle, a lovely couple from the west end came in to enquire about Mike. They weren't sure if they were ready for a new dog as they were still mourning the loss of Lou their beloved Boston but knew they wanted to help out. Mike started the new day with kennel cough, not surprising considering the conditions he was living in. When Chris and Danielle learned of this news they generously donated money to cover his vet bill! Before his vet visit Mike, Chris and Danielle got acquainted. It was very hard for me to contain my excitement as this was obviously a perfect match! After sleeping on it, Chris and Danielle agreed to take Mike home and we couldn't be happier! Speaking of happy, this picture says it all! Minutes after posting the first blog about Mike, the generosity, love and support was overwhelming! Mike and I would like to thank: Kristine Simon for donating a collar and leash set, Jamie and Champion Pet Food for donating 2 large bags of Acana, Lizzie Laing for donating waste bags and a canvas crate, Richard Guy for sharing our posts, Dee, Lauren and her superhero team, Susan, Holly, Simon, Joni, Rachelle, Chibi and all those who contacted us asking how they can help. Mike's new life looks bright because of all of you! THANK YOU! !